LEVITTOWN, Pa. (CNS) — The Catholic press in the United States and Canada is working to fulfill its mission of informing, educating and evangelizing Catholics by continuing to publish strong print publications while increasing their use of other media. More and more people want their news and feature articles available in more ways, at more frequent intervals, editors agreed as they spoke of websites, electronic book platforms, podcasts and mobile apps. Greg Erlandson, who is president of the Catholic Press Association and president and publisher of Our Sunday Visitor in Huntington, Ind., noted that the printed version of Catholic publications is still the most effective “push” medium — that is, one that is sent to readers on a regular basis without readers having to take the initiative to visit a website or take any other positive action. In Canada, Glen Argan of the Western Catholic Reporter, newspaper of the Diocese of Edmonton, Alberta, said a recent extensive readership study conducted by his newspaper showed the majority of respondents were not users of Internet-based media at all — although that hasn’t stopped his organization from having an active website for 15 years. Some people, he said, have asked if in print he’s building on “a burning platform.” So far, he said, “it’s only smoldering,” and the readership study confirmed his belief that print continues to look good for the foreseeable future. Along with other editors, Argan spoke of the ongoing call for religious education components in Catholic publications. An example of his response, he said, was a recent series of 30 articles he wrote on St. Francis de Sales’ “Introduction to the Devout Life,” a classic work on how all people are called to holiness regardless of their state in life. 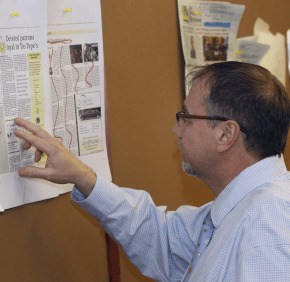 Christopher Gunty, editor and associate publisher of The Catholic Review, newspaper of the Baltimore Archdiocese, said that following an 18-month strategic planning process the Review has just launched a reformatted, biweekly print version along with a redesigned website. His organization is adding staff to enable them to have a more frequently updated website and other electronic media including social media such as Twitter and YouTube. The website is mobile-friendly and they’re working on developing smartphone apps. “We’re adding (staff) to our newsroom because we know that content is what’s going to drive this process forward,” said Gunty, who also is CEO of the newspaper’s parent publishing company, the Cathedral Foundation/CR Media. The newspaper, while published less frequently, will have more pages and will focus more on the “why” of Catholic news, while the electronic media more speedily deliver the who, what, when and where of traditional news reporting. Meanwhile, the multiple frequency and formats of the other media will, he said, enable the organization “to reach multiple audiences.” In addition to a Web editor, he now has a social media coordinator who can, for example, post an article on YouTube, then re-tweet a White House tweet with a link to the story and the tweet “What say you, Catholics?” to get a conversation going on a given topic. Penny Wiegert, immediate past president of the CPA and editor of The Observer, newspaper of the Diocese of Rockford, Ill., said she believes that there they have finally arrived at a point where even with their limited staff they can “marry our print product with our Web and video products.” She said she thinks everyone in the Catholic press is working on that. Now, she feels, is the time for the Catholic press in the U.S. to reach out to Catholic journalists across the globe and help them make the same kinds of transitions. She said “it would be tragic” if Catholics didn’t have an authoritative, official Catholic source in which to find accurate reporting about the news of the Catholic world. The mission of the Catholic press is “to reach and teach” Catholics everywhere, and every diocese has to discern how to support that mission. “We just have to keep improving in order to fulfill our mission,” which she said is challenging, rewarding and exhausting. The CPA designates February as Catholic Press Month. Wiegert said she is greatly encouraged by Erlandson’s recent appointment to the Pontifical Council for Social Communications because that opens another avenue of communication between Catholic journalists and the world’s Catholic bishops. He also noted the importance of the Catholic press in adult faith formation — a matter almost everyone agrees is of utmost importance but to which few resources are devoted. It’s critical, he said, to build on bishops’ awareness that they need the voice offered them by the Catholic media. “It’s essential for the church to communicate with its people,” he said.